I'll openly admit that I'm not a fan of day one patches for games. Especially big patches. When I'm met with something that keeps me from figuratively tearing into a fresh game experience, I tend to roll my eyes. In the case of The Evil Within, though? Man, this day one patch has certainly done a lot to improve the game. Digital Foundry is responsible for the video you see at the head of this clip. 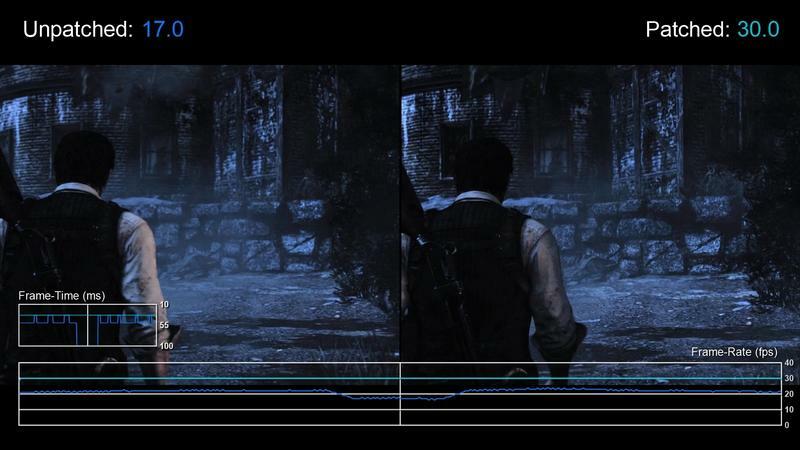 As it plays out, you'll notice that the pre-patch version of The Evil Within suffered criminally low framerates, tons of stuttering and texture problems. Post-patch? It's much, much better. Now, the game still dips below 30fps several times after the patch, but before the patch it was almost rarely at 30fps. It seems like it generally hovered in the low 20s and high teens before the patch was applied. That's sort of nuts, isn't it? Digital Foundry's findings come with a big warning: apply the patch. Don't ever play the pre-patch version of The Evil Within. It's a mess. Hold back on the big day one eye-roll and apply the patch. You'll be happy you did.